Designed by Tina Ratzer, the Twist a Twill blanket charms with its geometric pattern. The design is a modern interpretation of a classic patchwork quilt. The triangles are twisted and turned around and the result is a gorgeous, three-dimensional pattern. 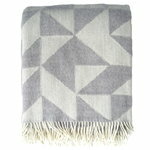 The warm and soft throw is made from 100 % merino wool.